“I think in terms of the instruments themselves – I sort of creep into their souls,” said Carl Nielsen (1865–1931). His three solo concertos for violin, flute, and clarinet are highly characteristic and expressive works that show how Nielsen developed as a composer, increasingly distancing himself from the classical conventions. This new recording by the New York Philharmonic and Alan Gilbert concludes the acclaimed Nielsen Project with Nikolaj Znaider, Robert Langevin, and Anthony McGill as soloists in vivid live performances from Avery Fisher Hall at Lincoln Center. "Med luftig afspændthed og stram struktur holder Gilbert en perfekt orkesterbalance i de tre koncerter." "...exceptional performances by violinist Nikolaj Znaider, flutist Robert Langevin, and clarinetist Anthony McGill…"
"The violin concerto alone makes this disk an absolute must, with, as a bonus, getting the other two, expertly and convincingly played […] Gilbert and the New York Philharmonic play and sound, with the help of excellent engineering…gorgeous. Bravissimo!" "Throughout this disc Alan Gilbert and the NYPO play on the kinship that exists between the symphonies that effectively gave the Flute and Clarinet Concertos breath. The latter is a substantial chip off the block that is the Fifth Symphony—and even has the clarinettist bring his old sparring partner, the side drum, with him. NYPO principal Anthony McGill revels effortlessly in its wild improvisatory nature and those elemental pyrotechnics." "Whether Nielsen is taking a retrospective or a prospective stance, Gilbert always seems to find the right approach to phrasing his thematic content, coloring it with just the right balance of instrumental resources, and managing the give-and-take between soloist and ensemble …this recent release is definitely an excellent way for the attentive listener to get to know the concertos." "...Znaider takes command and doesn’t let go. He varies his tone, as the music requires, from big and fruity to soft and silvery (...) The sound is terrific and one can hear all kinds of details in the orchestra that would otherwise go unnoticed. Dacapo’s production is fully in the luxury class. In every way this SACD is a winner and a fine conclusion to Alan Gilbert’s Nielsen cycle." "Nielsen’s Violin Concerto…gets an excellent performance from Nikolaj Znaider. Rarely has such an expansive piece felt so compact and finely-wrought, Znaider never letting Nielsen’s stream of ideas ramble. He’s handsomely supported by Alan Gilbert’s New York Philharmonic, the live recording well balanced." "Znaider, Langevin, McGill, Gilbert, and the Philharmonic are in complete command of Nielsen’s scores, rendering each with sonic elegance, technical brilliance, and expressive insight." "Mr. Gilbert balances the late-Romantic and searching contemporary elements of the symphonies in these spontaneous seeming yet organic performances." "... the quality of the New York Philharmonic's woodwind principals is evident throughout the disc." I. Prelude: Largo - Allegro cavallerésco 18:43 16,00 kr. II. Poco adagio - 6:19 9,60 kr. Rondo: Allegretto scherzando 10:06 12,80 kr. I. Allegro moderato 10:54 12,80 kr. II. Allegretto, un poco 7:21 9,60 kr. Allegretto un poco - 8:07 9,60 kr. Poco adagio - 4:49 6,40 kr. Allegro non troppo - Adagio - Allegro vivace 10:55 12,80 kr. 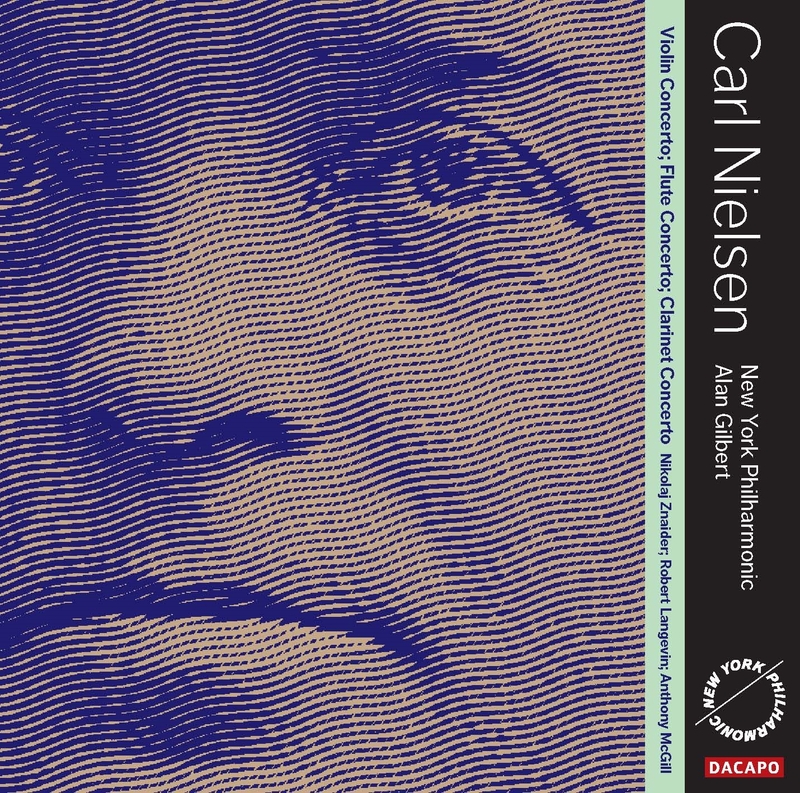 Carl Nielsen’s three solo concertos, along with his six symphonies, constitute the core of his orchestral music. Like the symphonies, each of the three concertos relates to the classical tradition in its own way. At the same time they show how Carl Nielsen developed, and increasingly distanced himself from the conventions. “I began by composing with the piano, later rearranging for the orchestra. The next stage was that I wrote my score directly for the instruments. Now I think in terms of the instruments themselves – I sort of creep into their souls,” said Carl Nielsen at the age of 60. It is this personification of the instruments that makes the three solo concertos so individual. In the Violin Concerto there is moreover a quite personal empathy with the solo instrument, because Nielsen was originally a violinist himself. Violin Concerto As a little boy Carl Nielsen was already playing the violin at weddings and feasts in the countryside: improvised dance music that continued until sunrise. From his early youth as a folk fiddler there is a radical leap to 1889, when Carl Nielsen was engaged at the age of 24 as a violinist in the Royal Danish Orchestra in Copenhagen. He never had a true career as a performing soloist, and he only wrote the Violin Concerto after resigning from his orchestral position to concentrate on composing. It is unlikely that he would have been able to perform the solo part himself. Most of the Violin Concerto was written in Edvard Grieg’s “composer’s hut” at Troldhaugen, which Nielsen was invited to borrow in the summer of 1911 by Grieg’s widow, Nina, who was half-Danish. Carl Nielsen himself conducted the first performance in Copenhagen, in 1912, which also featured the new Symphony No. 3, Sinfonia espansiva. It was an epoch-making evening for both Nielsen and Danish music. The soloist was the Royal Orchestra’s first violinist, Peder Møller, who in subsequent years well nigh had a patent on the Violin Concerto. Later it was primarily Nielsen’s son-in-law and confidant, the Hungarian violinist Emil Telmányi, who performed it. The Violin Concerto is unconventional and may seem confusing if one has not encountered Nielsen’s music before. It is in fact one of his most typical works, where several sides of his personality emerge in close order. The work is constructed in two large halves, each of which is divided into a slow and a fast section – an unusual but clear structure. The introduction is drastic: a giant solo cadenza over a pedal point. Here we meet the striving artist, and in Bach style Nielsen names this opening section Praeludium. As a contrast to the expansive gestures this is followed by a much more idyllic theme of graceful but downto- earth beauty. Abruptly Nielsen shifts into the main part of the concerto, designated Allegro cavalléresco – that is, chivalric and proud. The violin comes to the fore as a conqueror who knows his value, and Nielsen expresses his highly original thematic material with vitality and rounds it off with yet another great solo cadenza – this time in the ‘right’ place in a classical concerto. The second part begins with the oboe’s searching theme over the notes B-A-C-H. The odd motif is perfectly suited to Nielsen’s chromatic scanning of the borderland between major and minor. As in the first part, this intense, solemn passage moves abruptly into music of a quite different, outward-looking character: a teasing rondo in which Nielsen unleashes his inner folk fiddler. At the time some people thought the composer was gambling away his seriousness here. Could a grandly conceived solo concerto also be amusing? Nielsen, one of the greatest humorists of classical music, described the final movement to his wife as “a kind of half-cute, half-cheerful, rickety movement, almost without willpower, but good-natured and engaging like a warmly smiling layabout at his best moments. Do you like such a fellow?” he added self-ironically – at 46 still a very boyish man. The other two concertos come from a different phase of Nielsen’s life. In the 1920s his music made serious headway in the rest of Europe, and as a modernist he was now measured against both Bartók and Schoenberg. It is no coincidence that his last two concertos are for wind instruments. After writing his Wind Quintet in 1922 Carl Nielsen had the urge to write a concerto for each of the quintet’s five instruments, and at the same time to portray the personalities of the musicians who had given his chamber music work its first performance. Unfortunately only two of the planned five wind concertos were completed before Nielsen died in 1931. The Flute Concerto is from 1926, and was given its first performance the same year at a Carl Nielsen event in Paris that a number of benefactors had set up to present the Danish composer to an international audience. Ravel, Honegger and Roussel were among the colleagues he met on this occasion, and critics from several countries reported home. The flute soloist was the French-trained Holger Gilbert-Jespersen, and Emil Telmányi conducted. The reactions to the new Flute Concerto were predominantly positive, and Carl Nielsen was even awarded the Legion of Honour. The Flute Concerto is a marvellous example of Carl Nielsen’s late style: restless but precise, with incisive humour but a warm heart. Once more the concerto is given a twofold structure, but tightened up considerably. The flow is quick and varied, and the duration is only half that of the Violin Concerto (“That’s enough for a flute,” said Carl Nielsen). The omission of all the brass but one makes the soundscape more transparent, but Nielsen pulls no punches, and his Flute Concerto is unusually dynamic. It begins flickeringly, in search of a fixed key, and even after the statement of first and second subjects nothing is yet certain. The flute must share the first solo cadenza with the clarinet, and in the development section marching timpani and a threatening bass trombone make the soloist screech like a bird that has caught sight of a predator. Then the orchestra settles on a theme that at last gives the flute peace of mind. “The flute cannot deny its nature, it belongs in Arcadia and prefers the pastoral moods; the composer therefore has to adapt to this gentle nature if he will not risk being branded as a barbarian,” Carl Nielsen wrote in a witty programme note. All the same the movement ends unresolved, with the rumble of the timpani during the last solo cadenza. The second movement attempts to put the conflicts behind it with a naive melody, but soon the flute must take a stand with an inward, melancholy Adagio theme. Things brighten up a little with a cheering tempo di marcia 6/8 version of the first subject, but not enough to make the Adagio theme disappear. How is this to end? In wonderfully bizarre fashion Nielsen lets the swaggering trombone put things in their place; it barges in with the march theme and pilots the whole work into harbour with the pastoral theme from the first part. The flute is perplexed at its betrothal with its odd partner, but the point is typical of Carl Nielsen: agreement is not necessarily bliss. Fertile contrasts produce life and desire. The Clarinet Concerto, from 1928, is Carl Nielsen’s most radical work of all, and was rather frightening to his contemporaries. “Perhaps it doesn’t sound so good, but it doesn’t amuse me to compose music if I have to carry on in the same way,” he wrote to his pupil Nancy Dalberg. Nielsen had a great sense of the personality of the clarinet. He got to know it as a boy from an old blind folk musician who showed him how the clarinet could both weep and laugh, and in Copenhagen Nielsen’s enthusiasm for the clarinet was further stoked by the temperamental clarinettist Aage Oxenvad of the Royal Orchestra. The extreme fluctuations in the Clarinet Concerto are very much inspired by him. “The clarinet can be at once warm-hearted and utterly hysterical, mild as balm and shrill as a tramcar on poorly greased rails,” was one of Nielsen’s descriptions. The orchestral ensemble in the Clarinet Concerto is shaved down to just the strings, two horns and two bassoons, as well as an important secondary role for the snare drum, which functions as a sidekick even more than the trombone does in the Flute Concerto. In his Fifth Symphony Nielsen had already made clarinet and drum act as a dynamic combination with destructive powers, and here they are driven even further out. The music progresses entirely without breaks between the movements, and although one can subdivide the concerto into four contrasting sections, it is best conceived as one long scene. This time the conflict is played out in the polyphony, which is neither for nor against a fixed key. “I have such free motion in the instruments that I really have no idea of how it will sound,” Nielsen wrote with satisfaction about his bold score. Soloist and orchestra urge one another forward with the snare drum as third party, alternatively inciting and dividing. The clarinet is moreover up against its own temperament – already in its first melodic entry it loses control, and after just a few minutes the lid is blown off the kettle in a choleric double cadenza together with the drum. The starting point for the whole concerto is the initial subject in cellos and basses, which recalls a lopsided Danish hopsa played with a prowling slowness. The second recurring theme in the concerto is poco adagio and exhibits a deep melancholy that becomes ever more intense each time it appears. It is more painful even than the satanic march passages in the concerto. In the last section the clarinet – like the violin in its own concerto – pulls out a teasing folk-dance like motif. That lightens things up, but even though the Concerto is rounded off in a kind of spirit of conciliation, it never achieves a true serenity. Peace in our time? Hardly! The recording team of TimbreMusic wishes to thank Lawrence Rock, Audio Director of the New York Philharmonic, for his support during the productions. Dacapo acknowledges, with gratitude, the financial support of Carl Nielsen og Anne Marie Carl-Nielsens Legat, Augustinus Fonden and Beckett-Fonden. Steinway is the Official Piano of the New York Philharmonic and Avery Fisher Hall.